Father Philip Dabney, who is stationed at the Basilica of Our Lady of Perpetual Help (Mission Church) in Boston, was recently interviewed by CatholicTV about the perpetual novena to Our Lady of Perpetual Help, which is held at the church every week. 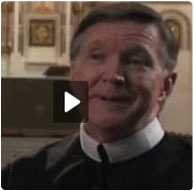 You can also watch Father Dabney’s regular Marian reflections on redemptorists.net. Click on the video icon on our homepage.